Yeah. So our water heater decided to spontaneously combust last night and I woke up to a house full of smoke. :( Sux right? Well, at least nothing else lit on fire, and hubby has already fixed us all up with a new water heater. Anyway there was no time for outfit pics this morning. And I dropped food on my skirt at lunch... so no after work pics. But I do have the polyvore I put together for the outfit. 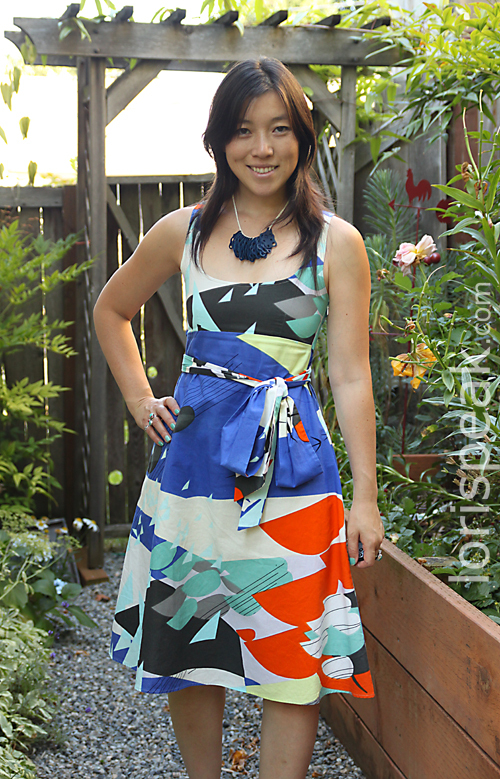 I love this Marimekko skirt (it was called the Marisco Skirt when sold at Anthropologie). This piece is another one of my ebay stalking successes! The orange, brown and red stripes totally remind me of some sheets my parents had when I was growing up. Plus, those stripes on a blue background offer such visual POP. Of course what I love about the skirt - it's awesome graphic quality - made it hard for me to figure out what to pair it with. I came across the picture to the left on the color collective and I used it for some color pairing inspiration. I think the green cardigan here really helped tie the outfit together. I was really happy with the way this outfit turned out. I did make some changes this morning though. 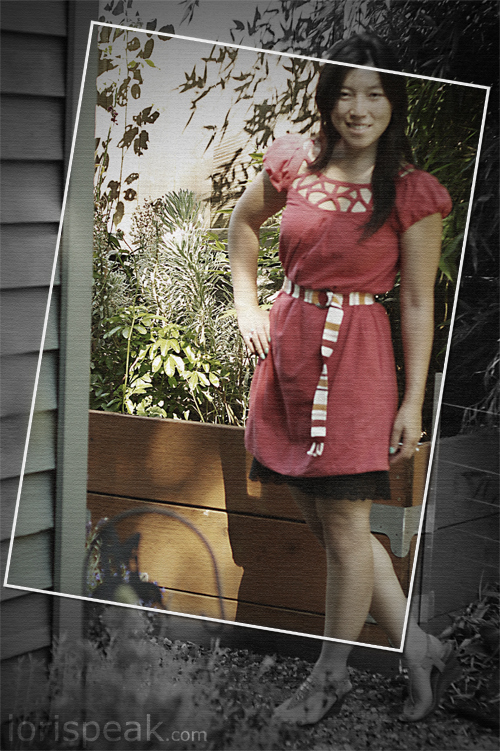 I ended up adding a brown braided skinny belt. I changed the tank top to a t-shirt and I wore brown booties instead of the flats because Seattle turned cold these past few days. Anyone else have this skirt? What would you pair this skirt with? I do have one pic for y'all. I've been meaning to post this for awhile, but I had the chance to meet up with Cindi from SimplyCindi and Cindi+Chris Photography earlier this summer. 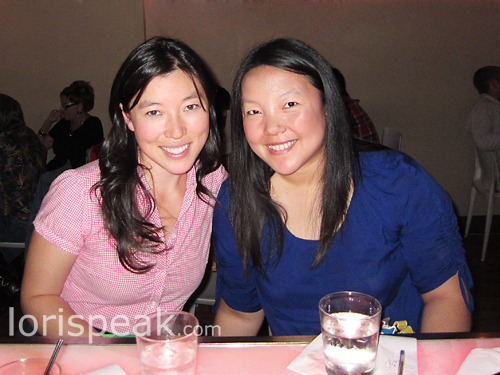 We chatted about food, Seattle, jobs, schools. It was super fun. Cindi is such a beautiful and warm individual. I'm sure I say this a lot, but I love how the internet has helped me meet such wonderful people that I probably wouldn't have met otherwise. And seriously, check out her photography with her husband. It's stellar. I wish I had such magic with my camera lens! Hey lovelies! Sorry I've been absentee bloggy-face! Things are a bit time crunched right now, but I wanted to post a few pics from my San Diego travels. We were busy travelers. Made it to the beach, the 1st California Mission, the zoo, the desert, Salton Sea (thought of as a preview to the apocalypse, check out this short documentary on the Salton Sea), and the largest US aircraft carrier museum! ginormous succulents everywhere. SO COOL! The rental car agency upgraded us to this car... not necessarily great for the desert, but we did get a lot of commentary from people, like: "Your car looks like a Terminator!" Here I'm hoping I don't land on a cactus! It got up to 111F! Happy Saturday everyone! I'm now in sunny San Diego with Ev for a small vacay. Right now, I'm writing from the dining room of our cute bed & breakfast on Coronado Island. I'm looking forward to some beautiful beaches, the zoo, Sea World, and neat desert hiking! Thursday was my birthday. And, this is the outfit I chose to wear! I've been in love with Marimekko for a long time. I grew up looking at my parents' huge (wall-sized) Kaivo hanging since before I was born. And, I've fallen in love with their beautiful textile prints. So you can imagine how thrilled I am by their dresses with Anthropologie. 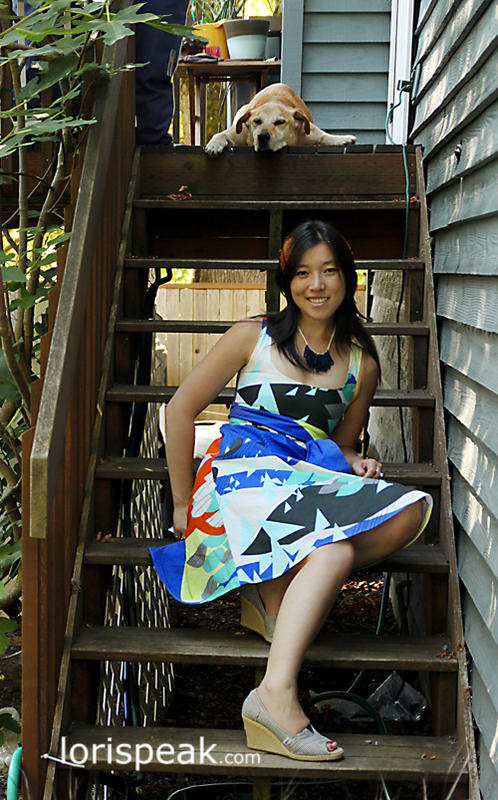 I stalked Anthropologie's Gulls of Gamma dress for a while on Ebay. The graphic print and bold colors were so appealing! I finally won one at a happy price point. I sent a preview picture from this post to my BFF, and she told me that it "looked like I'm wearing art!" That's what I love about many of the Marimekko pieces; they feel so incredibly special. Their prints are so graphic and visually interesting, I feel like I could look at them for ages. Here's a rather poorly done cinemagraph. I didn't have a good piece of footage for looping this time. Live and learn. Ok, I admit, part of the reason I love cinemagraphs is because they remind me of those moving pictures from Harry Potter. Somehow, cinemagraphs are partially magical when they're done right. I just gotta practice! On a completely separate topic, I wanted to show y'all my new lunch bag. (I know, I'm totally weird). Happily, it went so well with this dress I decided to throw it in a pic. This bag is one of my birthday gifts from my dear friends, and I love love love it! I knew I needed a lunch bag, because I had been toting my lunch around in ugly plastic film grocery bags (out of convenience). 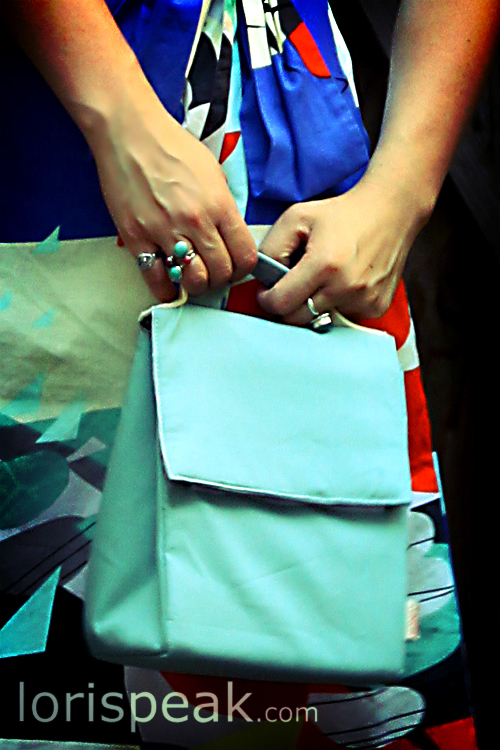 If you are looking for a lunch sack accessory, the Originals Good Lunch Sack in Blissful Blue is a BEAUTIFUL option. Happy August friends! This week is my 30th birthday. Kinda crazy that I've lived that long, huh? It also means I get my 15% off from Anthro! This year the discount is for online shopping. Unfortunately, I haven't made it into my local store for a while, so I'll be relying on many of y'alls reviews (thanks so much!). A few posts ago, Laura asked how I did the moving image in this post. That was an old school animated gif. I just took multiple photos and used an online animated gif maker like Picasian or Gickr to put the images together into one animated gif. On the other hand, the picture above started from a movie and became a series of multi-layered masked image frames in Photoshop (see a tutorial here). It is still technically an animated gif, but lately they're being called cinemagraphs. If you haven't seen them, you should check out some of these AMAZING ones: fashion cinemagraphs, movie-related cinemagraphs. They're really fun to play around with and highly addictive to make - so you may see a few more pop up on the blog now and then. It feels like everyone needs a good summery pair of beaded sandals. They go especially well with the whole Boho-chic vibe that's been going around. I found this Nine West pair at Marshall's for $20. 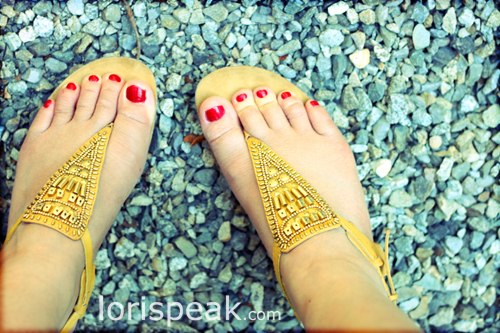 I love the soft leather and the ankle straps that keep the shoes firmly in place. The dress is Anthropologie's Rubidoux Shift. I found it at Goodwill, and I immediately fell in love with the neckline. It's like a magnified section of lace. So pretty! I'm just not a fan of the shift shape on me. I need waist definition! So of course I belted the dress :) . To get back some of the length I wore it with a black lace slip underneath.